Premium quality basecoat reducer designed for specific color systems. It provides excellent sag resistance, metallic stability and color accuracy. 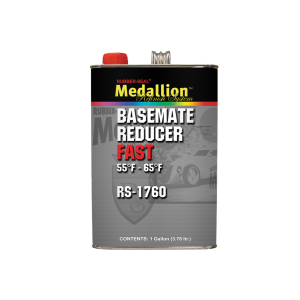 Fast Basecoat Reducer is designed for use in temperatures ranging between 55°F - 65°F (12°C - 18°C). Medium Basecoat Reducer is designed for use in temperatures ranging between 65°F - 75°F (18°C - 23°C). Slow Basecoat Reducer is designed for use in temperatures ranging between 75°F - 90°F (23°C - 32°C). Packaged in gallons and five-gallon pails.